Please keep in mind we are a motel not a hotel or a resort. Resorts are big, lavish and very expensive. They have everything under the sun and more. We are not a resort. Hotels are big, fancy and expensive. They also have everything under the sun. We are not a hotel. Motels are smaller, nice and affordable. 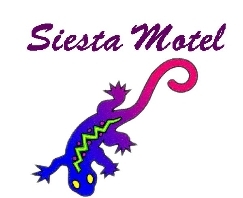 The Siesta does offer many amenities that most small motels do not. If you are looking for a quiet, extremely clean and affordable vacation then we are the place! Regular/Standard Rooms - Our spacious regular rooms all have 2 double/full size beds with a full size refrigerator, coffee maker, microwave and cable color televisions. Efficiency rooms - These are larger rooms featuring a full kitchen with seating areas. These rooms have pots, pans, dishes, silverware, toaster, glasses, coffee mugs, blender etc... Our efficiencies also have 2 double/full size beds for your comfort. All the regular motel rooms here at the Siesta have a writing desk and chair, large clothes closet with shelves and hanging space, various chairs, nightstands with lamps, television armoire w/drawers. The rooms feature air conditioners with individual controls for your comfort. Every room has its' own private bathroom with shower. The floors are beautiful terrazo tile with mother of pearl accents impeccably maintained since they were originally installed in 1958. We get compliments on our terrazo floors constantly and the Miami Herald actually did a travel article on our motel which praised the floors and our original tile bathrooms. Checkin is from 12 Noon to 5:00 P.M. - Anyone needing a late checkin must call us that day to make arrangements. We are happy to accommodate late checkins but if you do not call us before 5 pm we cannot guarantee you will be able to get into your room and you will be charged regardless. All of our rooms are non smoking. There are tables and chairs on the patio in front of every room for smoking and all the garden areas have ashtrays and shady areas for smoking. Anyone travelling with a pet must call us for reservations. If you make a reservation online and you have not called us prior to checking in you may be turned away and charged for the room if it does not rent.